Yesterday was a truly a unique day for me as I spent several hours with a group of terrific people in the great outdoors. Although the location wasn’t exactly the scenic forests of central Ontario, the forests in the northwest area of Toronto sufficed. 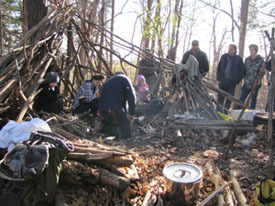 We all learned several ways to start a fire and took advantage of this skill to conjure up a survival soup. A former U.S. military ranger and an individual who challenged himself to living on his own up north for a year shared their wisdom and skills to an eager group of about thirty individuals. Some individuals ventured off to test their newly learned skills while others came with me on a mini-edible walk and talk. As we ventured off we took our tools so that we could collect some food for our soup. Yes, we are approaching the end of November and there is still food to be found out there. In order for a plant’s foliage (or tree) to be green, chloroplasts (a cellular organelle) are required to catalyze photosynthetic reactions. This is a process more commonly known as photosynthesis. Photosynthesis is a process that takes carbon dioxide, water and light energy to create carbohydrates. Chloroplasts range in shape and size and they are covered by two membranes. In very simple terms, there is a marvelous factory production that produces chlorophyll, glucose and sugar. Throughout the growing season plants produce a lot of sugar for the autumn and winter. Almost all plants halt sugar production in the winter because in the summer chlorophyll gathers more light energy than in the autumn therefore some plants will die off while others will remain green because of the stored sugar and starches. Some plants can survive the brutally cold temperatures of winter and others will die. This all hinges on the plant’s ability to winter-photosynthesize. Of course conifers fit into this category but there are some broadleaf plants that can retain some of their goodness in the winter. We also discovered catnip which did not make it into the soup. We were so thrilled with the find that just about everyone took some to take home. For us, it makes an incredibly tasting tea. Catnip tea calms, helps to alleviate stress, can alleviate insomnia and it has been known to treat anxiety, lessen migraines as well as relieve stomach cramps, gas, colic and indigestion. Of course for our pet cats, this plant sends then into a joyful euphoria. It was surprising to actually find goldenrod leaves that were still green as the vast majority has died off. We did not measure out quantities, but I did cut the leaves into small sizes so that they could be easily eaten. All the plant matter got tossed into the pot. (The roots got rinsed well before being added.) 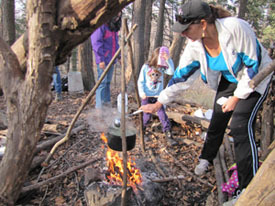 We brought the water to a boil, simmered for a few minutes then removed it from the fire and let sit for ten minutes. Alpha and beta carotene, lutein, calcium, magnesium, iron, phosphorus, potassium, sodium, copper, manganese, selenium, dietary fibre, carbohydrates, Omega-6 essential fatty acids and a substantial level of Omega-3. This soup was a healthy soup that not only provided us with antioxidants, but it also helped support our immune system and is great for the digestive system. And a special message to Joe; ok, so there is no meat to satisfy that paleo appetite of yours, but you have to admit, it has everything else you need. Not bad for a bunch of weeds huh?! Very interesting article! Thanks Karen! I was surprised at the abundance and variety of wild edibles we could find here in the Greater Toronto Area at the end of November! I also had no idea there was so much nutrition in the wild edibles we foraged! But that explains why, just like Sandra, I had a higher level of energy than usual after eating them; and the energy stayed with me throughout the evening. As they say, the proof is in the pudding or in this case in the soup! I didnt know that goldenrod was edible! Thanks.